Mike Tyson is one of the best fighters to have ever put on boxing gloves. Tons of talent, power, speed, athleticism, defense, skills, and work ethic. He would have been any trainer’s dream come true! I love his boxing technique and recommend it to all fighters. But with that said, his style (like many other boxing styles) does come with its own limitations. In my opinion, you need to have exactly his qualities to really make it work. Otherwise, you’ll should use a MODIFIED version of it. Please do not take this to mean that I think he’s a terrible boxer or that his style shouldn’t be used at all. Before I pick at Mike Tyson’s fighting style, let’s go over some of the strengths of his style! There are many reasons why someone would want to use his style and let’s keep in mind that I too, am a big fan of his. The Tyson peek-a-boo style can be very fun to use and also exciting to watch as a spectator. The peek-a-boo style, like many other boxing styles, is a collection of positions & strategies that dictate how a fighter stands, moves, defends, and throws punches. Another way to look at it is that it’s a specific stance that sets up specific strategies using specific movements. 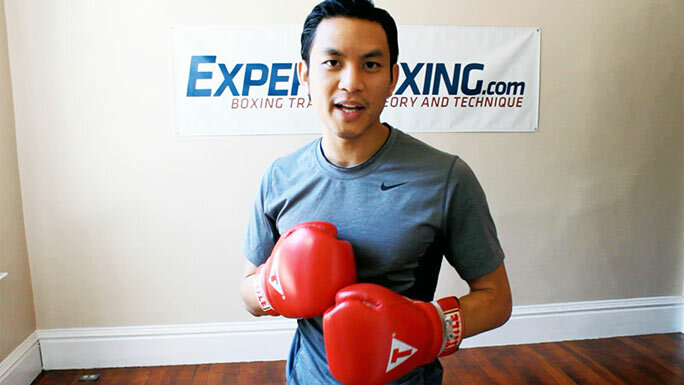 All boxing styles are basically a fighting stance, that allows for specific strategies using specific movements. The peek-a-boo style is useful for chasing down opponents and closing distance. The PAB’s squared-off position helps you cut off the ring and also threaten with punches from both hands. One underrated feature of this style is that it terrifies opponents when you close distance this way. They prefer you to follow them cautiously with jabs, not run straight in with scary counters. For those who often find themselves having to close the distance (shorter fighters), the PAB style is one of the best ways to threaten your opponent. Lots of quick movements, frenetic energy, very evasive, elusive AND EXPLOSIVE! As long as you’re well-conditioned and staying sharp, you really can dash your way in and land big shots. I wouldn’t say this is an easy way to close the distance. It’s more like a BOLD and threatening way. No opponent ever gets to relax when you come in like this. The peek-a-boo style really sets you up for a great offense. Why? Because it actually goes against the boxing rhythm. It’s a counter-rhythm style or “off-rhythm” style if you ask me. What’s the difference between ON-rhythm and OFF-rhythm? Most fighters are ON-rhythm. They punch and defend by matching each other’s rhythm. This makes the fight “safe” and predictable, in a way. Because both fighters are punching at the same speed, it’s easier for them to decide when to attack and when to defend, and also when to exchange. 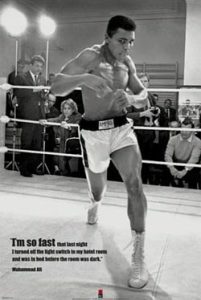 But when you fight OFF-rhythm, the timing no longer matches smoothly and anything can happen at any moment. Being an off-rhythm fighter allows you to land punches when opponents least expect it, AND being off-rhythm allows you to interrupt opponent’s attacks. This is a helpful timing for landing surprise counters and knockout punches. You’ll notice the off-rhythm offense fits really well with fidgety, high-energy fighters. Guys that like to stay in perpetual motion but (FIDGETY/OFF-RHYTHM motion). Want examples? Mike Tyson is one (DUH). He’s like a dog aching to bite. Guess who else I would put in the same category. Manny Pacquiao and Ricky Hatton! They’re perfect examples of a compact perpetual ball of energy that likes to keep moving around. 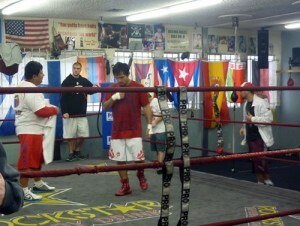 Both Pacquiao and Hatton are very off-rhythm and also like to slip from the waist side-to-side somewhat like Tyson. If anything, it fits Pacquiao even better since he stands from the southpaw position which benefits from its own inherit awkwardness qualities already. The peek-a-boo style is really alert 100% all the time. There’s no relaxed or passiveness in it. And due to its inherit off-rhythm counter-punching nature, opponents have to be cautious of you even when you’re just defending. It’s a great quality to have for anxious counter-punchers and just high volume fighters who like to pressure-pressure all the time. Just like it’s offense, the PAB style uses an off-rhythm defense as well. Instead of smoothly rolling off the punch and returning a counter, it quickly slips off the side (in a frantic darting motion) and the counters with a hard knockout shot. It may appear similar from the outside but it isn’t at all how it feels. Smooth counter-punches feel like your power comes from an EXACT-but-relaxed timing. Off-rhythm counter-punches feel like you’re rushing to squeeze all your power through a closing door. I should also say that smooth defense techniques (like rolling) don’t interrupt your opponents rhythm so much, since their punches land on your shoulders and they don’t lose balance. Off-rhythm defense techniques (like slipping) DO interrupt your opponents’ rhythm, since they lose balance when they miss you completely and their arms swing wearily through the air instead firing off the next punch. The Peek-a-boo boxing style is not at all what you call a smooth style or “efficient” boxing style. It’s fast, explosive, and intelligent but it isn’t subtle. How many older peek-a-boo style boxers have you ever seen? I would say almost none, because it requires so much athleticism and energy. Now don’t get me wrong…it’s a great fighting style if you’re that kind of high-volume, energetic boxer with a bottomless pit of energy. But if you’re more of a reserved, set-the-trap-and-let-them-come type of counter-puncher the peek-a-boo style won’t be as fun for you. It’ll seem like too much work. What IS “work” anyway? For most boxers, there is only one thing that is fun…which is punching. The peek-a-boo style requires a lot of non-punching movements. Fast footwork to get you into range, quick-shifting head movements to avoid incoming shots, and then more explosive bursts of energy to land the big punches you worked so hard to set up. So to me, anything you do that is NOT punching, will be considered “work”. And the PAB style requires a lot of energy to be spent on non-punching movements. Detractors of the peek-a-boo style often claim it wastes energy. The lazy guys (or older guys) prefer to spend their energy only on counter-punches. The energetic guys will happily spend their energy doing everything—bouncing around the ring, moving the head (even when not getting punched), throwing feints, throwing set-up punches, throwing combinations. Energetic guys love pressuring, and pushing the pace, reaching for the shot every time. The relaxed guys prefer waiting for the perfect moment. Be honest—do you REALLY like spending more energy than your opponents? Do you even HAVE more energy than your opponents? Do like spending lots of effort getting into position? Does it excite you to bounce around the entire time? Do you move your head naturally without having to be told? Or are you the opposite? A relaxed thinker who prefers to move only when movement is needed? Or maybe you prefer the safety and simplicity of just blocking. It’s also ok to be something in the middle, or even a bit of both. Anyway…take your time and figure out what you really are. It’s ok to change your answer later, too. Fighting off-rhythm is a really scary place. Why? Because you’re operating within the riskiest moments of timing. If your shots land, they do a lot of damage. But if THEIR shots land, YOU will take a lot of damage. This is the price you pay for always going against the rhythm. It’s like splashing the water instead of riding the waves. Look at smooth ON-rhythm fighters like Floyd Mayweather or James Toney. They can fight well into their older years and seem to never take a hard shot. Yes, you can chalk it up to defensive skill but it’s also the result of their style. Their style doesn’t put them in a place or at an interval to take hard shots. James Toney can show up to a fight completely out of shape and still walk out without taking much damage. But take a look at peek-a-book fighters like Mike Tyson & Floyd Patterson or even other off-rhythm fighters like Ricky Hatton and Manny Pacquiao…and you’ll see that they were often very vulnerable. Even when they didn’t go down, you can see that they took some hard shots. A little mis-step or miscalculation can be fatal for an off-rhythm fighter. Anytime you decide to be a forward-moving fighter, you need to have power. Simple as that. Anybody attempting to step forward into an opponent’s space and take chances weaving their head around is going to be eating shots no matter HOW GOOD their defense is. Going forward means your opponent has a few more chances to hit you before you can hit them. This is what happens when you’re walking into their space where their feet are already set. What happens if you DON’T have power? Well, the first thing is that your opponent has no respect for you and will trade punches until you end up on the canvas. He won’t be afraid of you and he won’t back up. He’ll just stand there exchanging his stronger punches for yours round after round. But add a little power and now what? He backs up, he defends, he doesn’t punch as much. It’s a beautiful to HAVE power, but a death sentence to NEED POWER. Although Tyson had outstanding boxing skills, his championship-run wasn’t sustainable if he wasn’t in absolute peak shape. I also wonder how many people would still be Mike Tyson or peek-a-boo fanatics if he didn’t have power. You know what else you need to be a forward-moving fighter? A good chin. Is it really a coincidence that forward-moving Mexican fighters all have great chins? Now, you might think good head movement can negate a bad chin but that isn’t the case. Mike Tyson’s style of head movement was going AGAINST the punches (slipping outside of punches), instead of going WITH the punches (rolling off the punches). Should you ever get caught slipping like Tyson, it would be a high chance of getting KO’ed or at least seriously rattled. Stepping away and rolling WITH the punches on the other hand isn’t as much of a risk. Not only is it so much easier to avoid punches that way but even IF one landed, it wouldn’t affect you as much. Am I flat out saying that you can’t ever use Tyson’s style if you don’t have a good chin? Absolutely not! If anything, head movement is even more important if you don’t have a good chin. What I AM suggesting however is that maybe you don’t use that style as much, or at least don’t come forward and move around so much in the early rounds when you aren’t fully warmed up yet. The peek-a-boo style is most definitely a “pro-style”. It’s meant to be fast, explosive, and exciting. I can’t say it’s “completely bad”, but definitely one of the less-effective amateur styles. The reason is simple: amateur scoring up until very recently was scored on a point system. Any clean contact was scored as a point, regardless of impact. So one big punch scoring a knockdown would still only register as 1 point, but 5 pitty pat punches would register as 5 points. They’ve since changed that to a 10-point scoring system that more closely mimics the scoring system used in professional boxing matches. 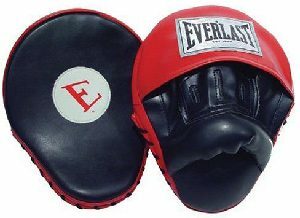 However, they still judge mostly by the number of punches landed and the bigger problem I think is the glove size and headgear being used. With headgear, bigger gloves and only 3 rounds, it’s quite difficult to get a knockout. There’s also the matter of how the style looks! If you’re slipping punches perfectly and landing clean head-popping shots, it looks fantastic. But if you’re wading in and getting caught by a lot of partial blows only to land 1 or 2 hard shots, you might look like a slow-footed brawler. As a pro, you should WIN THE CROWD. If you’re an amateur, make sure you WIN THE JUDGES. Good footwork, lots of punches, and super clean head-movement. Just because nothing landed clean on you doesn’t mean it actually looked that way. You also have to know that judges are human too and there will DEFINITELY be bias! I’ve seen many amateur fights where one guy clearly did more damage and pushed the fight the entire time but still lost. Mike Tyson had a compact body. Built like a little tank. Everything was naturally tucked in tight. Did you get that? Everything was NATURALLY tucked in tight. So from his regular boxing stance, his chin and body were already pretty easy to cover up. It hinders your balance/footwork – since your body is unnaturally folded up. It slows your punches – taller fighters are punching down; so holding the hands up high will take longer to get to the target. Longer arms can be held a little further out; putting them by the chin means your punches have to travel longer before they can hit the target. Tires your arms – long arms have the advantage of parrying punches from farther away. By keeping your arms close, your long arms have to work more to block and counter-punch. Can’t push – taller/longer fighters will lose the ability to push opponents away if they keep their hands close to home. Can’t clinch – this is a huge benefit for taller/longer opponents on the inside. Long arms can grab when there is no space whereas shorter arms have more room/leverage to punch on the inside. Taller/longer fighters should not compact their fighting stance! The funny thing is that Mike Tyson’s style of head movement (sideways bobbing at the waist) isn’t even possible for taller fighters. It’s not easy for your body to do that without burning lots of energy or losing balance if you don’t have a compact frame. Tall guys don’t move like short guys and vice versa. is not easy for tall guys to do. This is probably the biggest disadvantage of the peek-a-boo style, when it’s not necessary! You have to know that Tyson uses the peek-a-boo style because he’s a shorter fighter and with shorter arms. He HAS to wade through many punches when he’s out of reach and needs to move his head at all kinds of crazy angles. And then when he’s in range, he has to be as fast as possible to do maximum damage before his opponent is out of range again. He’s a split-second counter-punching surgeon by necessity. But what if you’re taller? Do you REALLY need to come forward like Tyson? You might do better just moving backwards and letting your opponent walk himself into your punches. Do you even need to do all that fancy head movement? Think about it for a second. The only time you use head movement is when you’re trying to avoid a punch AND counter at the same time. But what if you could counter just standing where you are. Look at Wladimir Klitschko. Absolute zero head movement needed (he still uses it, mind you), because he can punch at you long before you’ll ever get to him. And you’ll also notice that many of the taller fighters are more likely to pull their head OUT of range than to duck their head under or slip their head down further into their opponent’s range. Same goes for the longer-armed fighters. Do you REALLY need to use head movement in order to set up your shots? Maybe not. Maybe you’re able to throw punches without much worry. In that case, it might benefit you as well to work on keeping a distance (maintaining your range advantage) instead of closing the distance and putting you in a place where you have to worry about head movement. Longer armed fighters can skip the distance-closing step, and go straight to the explosive punching! You have to know that Tyson had to move his head so much because he was a shorter fighter. He was often at a distance where his opponents could reach him, but he couldn’t reach them. But as soon as he got close, he threw as many punches as he could right away. So my point is: Tyson threw as soon as he got into range. The defense was only used to get into range. If you have longer arms and/or don’t need to go forward to get into range, then you probably don’t need to use the peek-a-boo style at all. Tyson always had to go forward, and threw when he got into range. If you don’t have to go forward to get into range, you don’t need the peek-a-boo style. I think there are elements of the peek-a-boo that are crucial for all fighters, no matter what style of boxing they use. Good head movement, explosive punching, and intelligent reflexes will never go out of fashion. What’s most important is that you use your inspirations to find YOUR style. Even Mike Tyson himself was a collection of other fighters that inspired him…Jack Dempsey and Roberto Duran were the most influential. Patterson, Torres, and Tyson all had their own unique version of the peek-a-boo. And if the way of the peek-a-boo is for you, I hope you do it YOUR WAY. Learn but don’t just copy Mike Tyson’s peek-a-boo, make it yours. If you look closely enough, you can see elements of the peek-a-boo style or Mike Tyson’s boxing style in many other fighters. 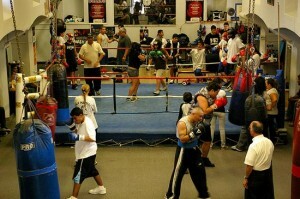 I can see it in Gamboa, Hatton, Cotto, Pacquiao, and just about half the beginner fighters at any gym. Tyson was one of the most exciting boxers ever. I admire him and greatly respect all his abilities. On a higher level, I also respect all the difficulties he had to overcome in becoming one of the most powerful fighters to have ever lived. His style was a result of having to overcome his natural disadvantages. I wrote this article not to hate on the style but to explain the limitations for the benefit of all fighters (using PAB or not). The peek-a-boo is a beautiful piece of boxing art and deserves to be preserved and evolved in boxing history.When used by the right kind of fighters with the right body type and temperament for the style, it is beautiful. But when done incorrectly, it just goes against conventional boxing logic and creates unnecessary hardships.I highlighted the disadvantages not because that’s all I see in the style but because I feel the general public isn’t aware of instances where the PAB works against you. At the very least, you should understand the limitations of any technique/style to truly maximize it. Have you noticed anything from how Vasyl Lomanchenko? And why don’t you do more work on body punching? Its Ok I haven’t been commenting as much over the last few years because I have been into Systema. I made a guide and video on Lomachenko already. You haven’t seen it? 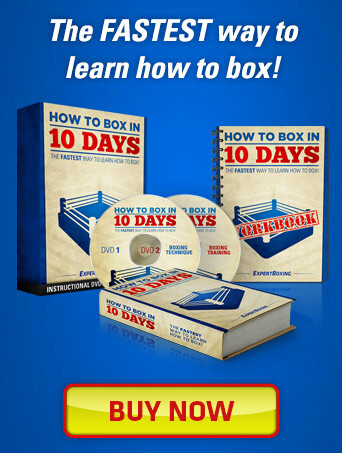 I’ve also done videos on body punching as well although yes, a written guide on that can come next! Hi Johnny,long time not seen-how are you,my friend? In case of peekaboo must say this style is very old-it was jose torres and floyd patterson that the two boxers fighting with this style,but it was not in that angry mode like tyson-so you can see its a question of dynamic and it is moore individual than people just think only tyson was so. Thanks for sharing, Pat! I’ve seen those videos and do agree that the peek-a-boo style can be done in many different ways. Hey, I’m Joey Hadley of Memphis, TN and was a professional boxer who was trained in his house in Catskill, NY for all of my professional career. You have a very interesting but limited understanding of the Cus D’Amato style of and philosophy of boxing. Calling the “peek a Boo” style solely by the fights and actions of Mike Tyson is greatly the understating how Cus would developing the style and stance to each fighter, meeting them where they are at. I had an explosive right hand that won me numerous awards as a young man and it was that resilience I showed in the ring that made him want to contact me. There is much more to the style and stance that people read and hear on the internet or limited literature on the subject that it is sad to see is so misunderstood. So much of the stance was simple and effective and so so much more was psychology and life changing, I urge you to visit me and my protege, Nick Finlayson’s youtube page for some more information if you are interesting in more information on the subject. We of course appreciate any exposure and discourse on the subject of of Cus and his life and methods. You have an absolutely amazing site and I hope to one day be as influential as you in this new digital world. All the best my friend. Thanks for stopping by. What better opportunity than to speak with an official representative and living descendant of the original Peek-a-Boo style. There are definitely nuances to this exciting style that I could familiarize myself with. I did click through your site a bit just now and also caught a few of your comments on my Youtube channel as well. Just for the sake of staying on this current topic for the moment, could you add your 2 cents to the opinions I shared above? Let me know what things you agreed with, what things you didn’t, and how you might have explained things differently in your own words. It would be great for my readers (and myself included) to hear multiple angles on this subject. And thank you for the kind comments about the site. I do my best to share my passion and hope to preserve the art of boxing for future decades to come. Also on the main page we have been uploading more of my fights with commentary and a personal documentary on the man and coach I knew, Cus D’amato. Thank you very much. Hi Joey. I’m curious, what was Cus like as a trainer and as a person? Did he had a short temper and did he had sense humor or was he was more of a serious person? Thank you. And yes I will link them. We have organized them a bit more into playlists, but after the first one, they can be viewed in any order as of right now, we are working on fleshing out the videos as we learn! Your videos certainly were influential in how we wanted to share our information as well, so we hope as we move forward we learn to translate it as fluently as you do in your videos and tutorial materials. With the modern boxing gym becoming more rare, sites like these will become modern gym/resources, and you’ve certainly gotten ahead of that on the right foot. We are just a two man set up right now, but also big fans of what you do! Good post Johnny, you really gotta be like Tyson physically and mentally to fight like him. Would it be possible for you to do an advantages/disadvantages to Mayweather’s philly shell fighting style? I would love to take a shot at that as a fan, not as an expert. I think that style is great, it just doesn’t fit all body types. I enjoyed the article. Very informative. Would you be interested in doing one on Archie Moore’s style? Would take a lot of video study since I didn’t watch so many hours of his footage like I did with newer guys but fun project for sure! It would be awesome if you did an analyst of Joe Frazier/ Henry Armstrong/ Dwight Muhammad Qawi defensive style. Those guys would be really fun to cover! Will take me some time! That style is a lot of fun to use, especially when you have energy and know how to time those exchanges. Peek a boo ends up being the boo-hoo strategy, as eventually you are going to get clocked coming in. You can not punch correctly with your hands in front of your face. Peek a boo works for short compact fighters if they have the other skills to make it work, otherwise you are just wading in and taking a beating from the other fighter. My 2 cents. I would say Duran is a high-energy, hyrid slick-sharp inside-fighter. He is slick and sharp. You can see him rolling and slipping movements smoothly on the inside and the also ducking and cutting around on the inside as well. Just very cagey, a veteran’s veteran. All-time great and one of my favorites. It’s no wonder Tyson liked him so much. Pretty spot on description I’d say! One of my favourites too. So elusive yet so dangerous at all ranges. Ur understanding about the style wrong. I am on of the disciples of the D’mato School. Hey Jhonny, i’m brazilian and love the peek a boo style and Tyson’s skills, i started train PAB and like that Tyson. I really like your site, could not you teach beginner and advanced peek a boo technicians?